I'm not one who likes to label someone a "best friend." It has always seemed like an exclusionary term to me and could be taken wrongly by other good friends. (Can't we all just be friends?) That's not to say that we can't have friends we feel closer to or that we get along better with, because of course we all have those. Having said that, a close childhood friend of mine turns 54 tomorrow. If I had to pigeonhole someone as a best friend growing up, it would be Pat. He was one of a core of 5 of us high school buddies that hung out a lot. Pat and I have so many good stories, most of which took place during our college years. If you've read Dirty Shirt, he's a main character in the first section on friends. I think I got to know Pat best when we were both bench warmers for the 8th grade football team at St. Luke's. There's something unifying about not playing much. Well, when we went to high school, we hung out together with all the other "straight" kids. We never got into trouble much and our senses of humor kind of meshed. Later when we went to the University of Minnesota together, we both struggled right out of the gate with what we wanted to be when we grew up. I'm not sure he ever declared a major at the University, but he used to get a kick out of telling girls that he was majoring in Mortuary Science. It was his somewhat twisted sense of humor that drew me to him as a friend. For all of his struggles at the U of M, Pat eventually found his calling in ministry. He enrolled in a Bible training center in Tulsa, Oklahoma after a couple of years of floundering in Minnesota. It was a perfect fit for Pat and eventually he graduated from there with a ministerial degree. It was during his years there that I credit Pat with shaping my own faith. He frequently shared books with me, helped me answer the tough questions and, more than anything, walked the walk. He knew what "living it out" meant and showed it in all he did. One of his biggest weaknesses was people with car troubles. He was always stopping to help, often meaning he was late to wherever he was headed. He was kind, gentle, respectful and, as one of my other friends put it, almost "friendly to a fault" if that is possible. One of the more memorable events in our friendship has an ironic twist to it. During one of his visits back to Minnesota during college, we went Christmas shopping at a local mall. 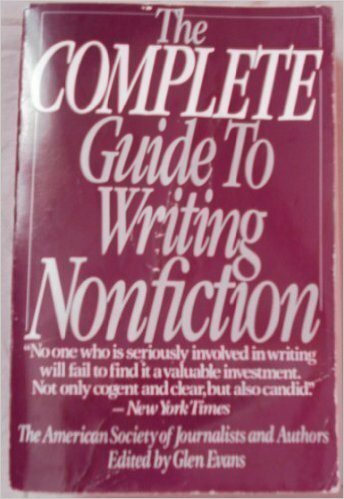 We went into a bookstore and Pat bought me The Complete Book of Writing Nonfiction. At the time, he knew I liked to write, so he gave me the book. I think he may have even said something like maybe I'd write a book someday. I remember thinking that he obviously had more faith in my ability than I did. I can't say I ever cracked the book, but I do think it planted a deep seed in me that made me think, hmmmm. I've gotten together with Pat a few times over the past five years and we've picked up right where we left off. He has a wife and three beautiful kids, in fact, his daughter attends the U of M, as does my daughter Sarah. We were joking about how our ghosts are haunting the U of M again, via out children. Fortunately for the University, they are way better students than we ever were. Happy Birthday to my old friend Pat!